So it should come as no surprise that I’ve been going to Disneyland with some degree of frequency this year. 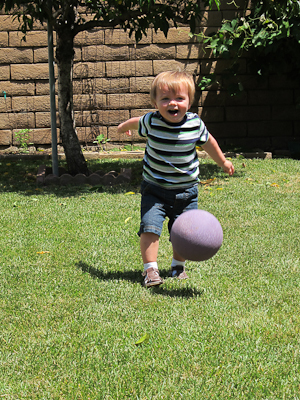 The vast majority of the time I’ve taken Theo. And having done that so many times, I’ve more or less developed a system of what I bring. And you, lucky readers, are going to hear all about it. Now most of the time we go for short periods–3 hours or less, so I keep my bring-alongs to a minimum, but I’ll address longer visits at the end. 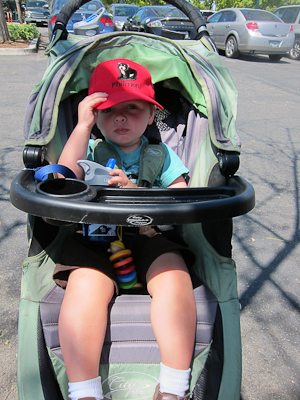 So here you go–Disneyland Essentials for a 2-year-old. 1) Stroller. I love my stroller. It’s a Baby Jogger City Mini and if I could marry one baby item, it would be my City Mini. There are only a couple of very small things I’m not fond of, and the updated version fixes some of them, but for the price, it’s all kinds of awesome. And incidentally, the Disneyland rental strollers are a stripped-down version of the City Mini, so it gets the official thumbs-up from Disneyland too. 10 bucks? Sign me up! And what’s IN my parent console? Good question! Uh-oh, it just occurred to me that I was using a numbered list (or in technical writing terms, an ordered list, but I have turned my back on that aspect of my past–farewell, technical writing!) for the above part and now I need another one. So I’m going to use letters. Because letters are nice like that. A) Refillable water bottle. I have to say that this is my #1 essential item for Disneyland. If you bring nothing else, bring a water bottle. It doesn’t have to be all shiny and pretty and BPA-free, but for the love of God, water is free in the park. FREE! Do you know how many free things there are in the park? Not very many!! So take advantage of as many freebies as possible. Like water. B) Chapstick. It’s the little green thing next to the water bottle. Chapstick with some SPF is preferable. C) Snack for the kid. In this case these are leftover pancakes from breakfast. Not with syrup or anything–I’m not crazy. Pancakes with applesauce. And yes, Theo ate the breakfast portion about an hour before I gave him these, but waste not, want not! D) Camera case, with or without camera. Now this one gets a little bit tricky. Since I’m constantly taking pictures, I keep my camera here where I can grab it easily. 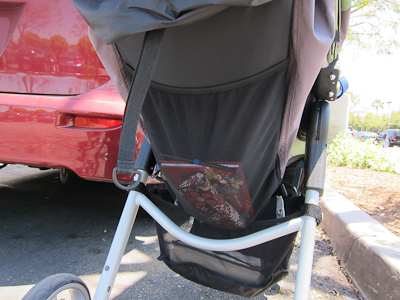 BUT, you have to remember to take it out of the console every time you leave the stroller. If you’re a forgetful kind of person, then don’t put your camera here. Also, if you have another person with you, the $10 Sunshine Kids console has another cup holder, just perfect for your second refillable water bottle. E) Extra napkins. Once again, something you can get for FREE! FREE!! FREE!!! Now I’m really of the mindset that you can’t have too many napkins. I mean, you CAN, so let’s not go overboard here, but in general, it never hurts to have a few extra napkins handy. Especially if you’ve gotten food and didn’t end up using them–don’t throw away those clean napkins! A tree cries every time you throw away a perfectly good napkin! Anyway, napkins come in extremely handy, so keep them handy. Hey, that’s kind of catchy! Oh and a tangential but somewhat related story–in my family, we are in the habit of keeping extra napkins in the glove compartment of the car. In my dad’s car, the napkins almost explode out of the compartment when you open it. Kevin was mocking me for developing the same habit until one day, he had to make a sudden stop and a soda with a loose lid flew into the dashboard. And guess who had all kinds of napkins handy for instant cleanup? That’s right! Me! WHO’S LAUGHING NOW, BUDDY? Although there was payback since I was kind of mocking him for carrying a fire extinguisher around in his trunk and then this one time he actually used it to put out a fire on someone else’s car. So no more mocking. Oh wait, I’ve completely lost track of my numbering system here. Let’s go with Roman numerals. I) Autograph book with pen. The autograph book came with this little dinky pen and when Goofy was trying to use it (successfully, much to my amazement) I felt really bad, so I stuck in my own regular-sized pen. I’ve also heard it’s a good idea to put in one of those clicky Sharpies for maximum character ease, but honestly I haven’t really gotten around to it yet. II) Sunglass case. If you’re cool like me, yours will have really ugly flowers all over it. The reason is because I have prescription sunglasses that I swap off with my regular glasses and because I have a funny-shaped head, they don’t fit in regular glasses cases. Don’t laugh. It’s not polite. A mini diaper bag, containing a couple of diapers and wipes. If your child is no longer in diapers, this is optional. Also, this mini bag pretty much lives in the stroller basket. Next to the extra napkins. A cute child. Or an ugly one, if that's all you have on hand. If your child will wear a hat, bring that. It’s really helpful. However, if your child is like mine, the hat is pretty temporary. It’s always worth a try though. Because kids get dehydrated too! Child’s water bottle. I can’t think of anything else to say about that. 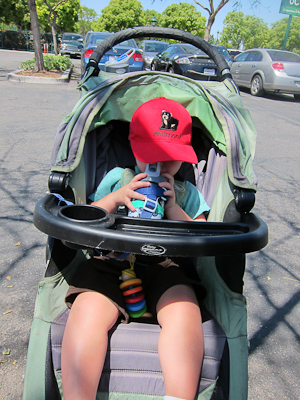 The Sippi Grip attaches to your water bottle and your stroller and if your child is prone to tossing water bottles in a fit of pique like mine is, it’s very handy. My calves aren't actually this big. I swear. Tennis shoes. 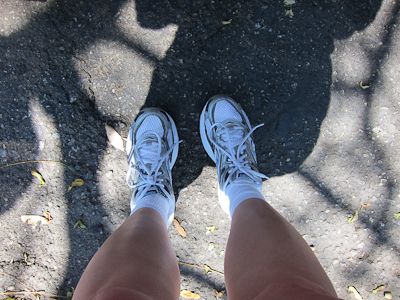 There’s some debate on this subject, but I still maintain that a good, supportive set of athletic shoes is your best footwear for the park. Particularly if you need arch support. I’m not going to argue this point except to say that the worst footwear option is Crocs clogs. Well, actually the worst footwear option is high heels, but Crocs are a close second. Not only because they are a fashion horror show, but because when they get wet, they really chafe. I can’t even tell you how many kids I see walking around with bleeding blisters from Crocs. Gross. And also, ouch. So since I pretty much abandoned my numbering scheme up there, I’ll wrap it all up here for you. 16) Car key, money, park tickets. I carry these in a small backpack/purse but you can put them somewhere else convenient. 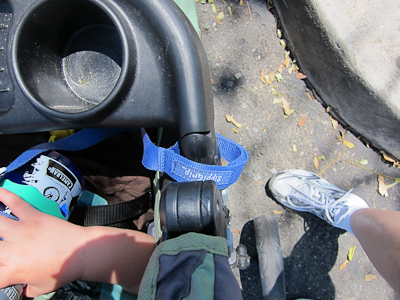 So there you go–my minimal essentials for toddlers at Disneyland. And because these pictures were boring, I’m going to add some gratuitous cuteness. Have you no shame, Shelby? Nope. ADDING TO ORIGINAL POST: I had originally intended this post to just be a list of items that I bring with me for my situation (Disneyland, not the Mouse-in-Law, and a child who is too young to leave my side) rather than general tips for bringing kids to Disneyland. I could write a tip post if people are interested? Also, there are some GREAT tips from readers in the comments below. Thanks for sharing!! And feel free to add your own tips in the comments too! And I forgot to add that I use a small backpack as my purse and that’s where I keep my credit cards, pass, etc. so I added that. I can’t speak for the kids with blisters problem, but Crocs are my go-to shoe for D-land. They make my feet happy. And they aren’t the ugly original clog style, they are slightly less ugly, or Crocs flip flops in the summer. Nah, I’m talking about the clogs. Flip flops are different. -bracelet with the word “mom” and my cell phone number on it. -when the kids were older, the lanyard and the collectors pins. If a kid gets lost at Disney, they can go to an an employee at the kiosk that cells the trading pins and they will take them to lost and found. I always had the kids go up and ask the adults at the kiosks for their trade – to get them used to talking to an appropriate adult. I told them that the person who mans the kiosk is who they should go to if they get lost. -Disposable camera for them to take their own pictures – my girls loved this. -Epcott has a Kim Possible scavenger hunt across the park which is very entertaining. -If you have one child who is unwilling to ride a ride, tell the attendant. He will let one family member sit with the child who is willing while an adult waits with the other child. At the end of one ride length, he will let the adults trade so the child who likes the ride gets to ride it twice. -Epcott has coloring stations for kids in each country. The kids get a mask in the first country you visit. Each additional country has something to add to the mask at coloring stations. My girls enjoyed this. Clicky Sharpies are THE way to go! We got some awesome signatures when we presented our clicky sharpie – Jasmine sat and drew a whole 8×11″ picture because she liked the pen. Totally worth the extra couple of bucks. Wow, that sounds awesome with the character autographs! Maybe I will actually make the effort to go buy one! Small world – I saw a kid with a phone number written on their forearm at Small World (seriously)! GREAT idea! We used to have one of those mini-diaper bags. It was great because it opened into a changing pad. Somehow it got lost, kids not even one yet. I may just have to get another one if I cannot find it, which is likely because I have no clue where it could be. That Sippy Cup strap is pretty cool. Thanks for the link. I highly recommend the mini diaper bag, especially when Theo was younger and needed more frequent changes. 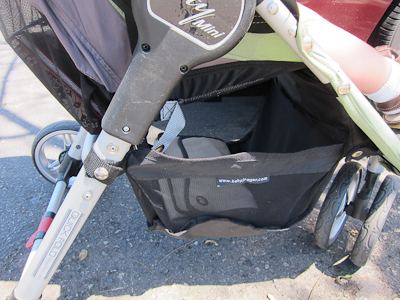 Keeping it in the stroller permanently and having a similar one in my car has saved my hide many, many times. Also, the Sippigrip is SO worth the money–that brand, too. It has a rubber backing on the velcro strap that goes around the bottle so it doesn’t slip (other brands don’t). Theo can undo the velcro, but for the most part he does leave it alone and it’s saved countless water bottles and sippy cups. You can use it for a snack catcher too. Good list! I was lugging plastic water bottles into DL until I discovered the joys of Free Ice Water! Now I don’t even bring a refillable–we just find a counter service restaurant (they don’t have ice and/or water at the kiosks) and ask for as many as we need. 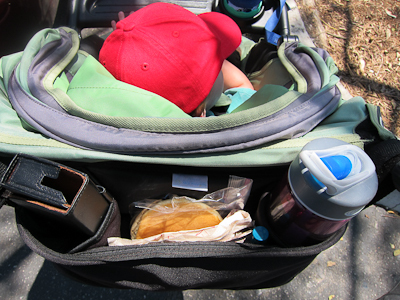 I have a wrist strap zippered pouch I take to DL that holds my pass/credit card/id/cash, lipgloss, & phone, and a small camera that clips onto my belt–so I’m always ready to jump on a ride or chase a character without worrying about stashing anything in the stroller! Great tips! I also get ice water at restaurants and put it in my bottle, but I didn’t think of that for this post because most of the time I don’t buy food there. Thanks for adding your tips! Shelby it is a good thing you wrote this all down, because once your child is no longer in diapers or needs a stroller you somehow manage to forget it all. I finally got used to no longer lugging a diaper bag around for DS, and now that I’ve just adopted DD I have to remember to bring all that toddler stuff again. A couple of times now I have actually gone out and realized I forgot the entire diaper bag! Um sorry kid, could you just hold it until we get home? One essential that we needed in DL for DS when he was 2 was the monkey on your back tether. I know some may flame me for tethering my child to me like a dog, but they never had to walk around DL with a child who would frequently bolt without notice. I was so terrified I would lose him that I even bought this alarm shaped like a teddy bear that I attached to his clothing. It had a remote that I could push that would set off a really loud alarm. Thank goodness I never had to use it since I think it would probably terrify everyone in the immediate vicinity. Phew! Obviously I feel strongly on the issue :lol:. I may need one of those for my house. Annika climbed over the baby gate and out the front door yesterday evening. She went straight to our neighborhood pool where everyone asked “where’s your mommy?” And we had 3 adults in the room when it happened! Our list would include a full dinner for everyone. Disneyland let’s you bring in food! And a lot of it! Yup were “those people.” LOL We usually always have Del Taco in our stroller at any given time.